May bows to an extraordinary menu of harness racing features that takes us across the borders of states and countries. The older pacing hombres duke it out in Canada. State-breds battle in divisions in New York and they finalize champs in New Jersey. The glamour-boy pacers hold sway at Yonkers in the race no one expected would not include He’s Watching. More colt pacers battle in a trio of divisional stakes at Mohawk and there are more aged pacers in the Empire State on Sunday at Tioga, trotters, too. Soph-colt-and-filly trotter’ events for the week are the contents of our seasonal blog, the Hambletonian Trail. Follow our analysis of the races featuring the eligibles to this year’s August trotting classics at The Meadowlands. For this weekend’s events, go to the “Trail” blog and peruse our analysis. Check weekdays where there are not TwinSpires blogs for other events not covered within the blog deadlines. 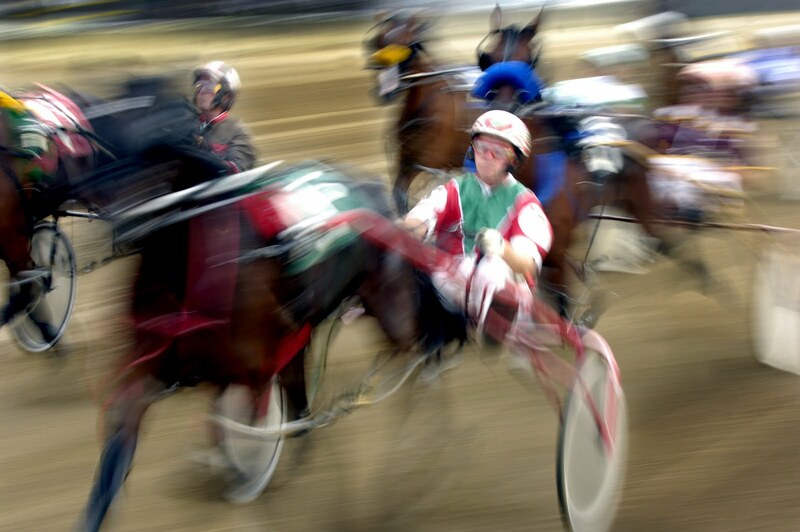 The Molson Pace is a sizzling field of fiery and flashy pacers. A staple of the Western Fair season in Ontario is a visit from the continent’s top FFA male pacers for shares in the six-digit purse (this year it is $150,000 Canadian). This division, of course, allows for annual participation among the aged side-steppers. Defending champion State Treasurer is back, drawing the half-mile’s coveted rail position in this Friday, May 30 event. State Treasurer is amid a great start this season, winning his most recent three, including a 1:48.3 at Mohawk. Two-time event-winner Foiled Again drew post 7 in the eight-horse field. Dancin Yankee, who set a 1:47.2 world record recently at Pocono, drew post while Bettors Edge (post 2), Bandolito (post 3), Apprentice Hanover (post 4), P H Supercam (post 6) and Captive Audience (post 8) complete the cast. This race is all about position, speed and even endurance, since a strong early move to the outside could win it without a fierce duel. There is a case to be made for each of these, as the talent of the field goes deep, but you will have to pick a scenario for each to earn being first at the wire after four turns. On the wagering side for the evening at Western Fair, the Early Pick-4 will feature a $7,500 guaranteed pool with a $10,000 guarantee on the Late Pick-4. There’s a Super Hi-5 in Race 7, will also feature a $10,000 guaranteed pool. Standout state-bred All Bets Off drew post 4 in May 30’s $300,000 Art Rooney Pace Final at Yonkers Raceway. The absence of He’s Watching was not even predicted by this sharp blog, even though we had last week’s elim winner that soundly defeated him. He’s Watching was terrible and didn’t make the final. He is scheduled to go to Mohawk, as explained in the story on the Somebeachsomewhere elims (below). All Bets Off, the other “Rooney” elim winner, is trained and co-owned by Ron Burke, and is a top choice in the final. Stevensville, our wire-to-wire winner against He’s Watching, goes for co-owner/trainer Ray Schnittker and should go off a lot less than he did when he won at 9-1. Thereisapaceforus was scratched after the draw (he got post 1). That moved Maxi Bon from the “also eligible” list into the race and inside his seven rivals. That also made Maxi Bon and Gold Rocks, both trained by Tony Alagna, a coupled entry. Alagna’s third horse, Bondi Hanover, is a separate wagering interest (having separate ownership than the other pair). The field in post order: 1-Maxi Bon, 2-Bondi Hanover, 3-Gold Rocks, 4-All Bets Off, 5-Some Playa, 6-Stevensville, 7-Unlocked and 8-Ideal Fashion. There is truly no reason that Stevensville cannot repeat his performance last week but All Bets Off is not going to allow a pace-commanding performance. Last week we liked Maxi Bon in the second elim and he was off on a productive mile before breaking badly enough to finish fifth, which was last. He should have something important to say about the result of this race and would come as no surprise to us if he won at a decent price, even if he was the third choice. We like him in tandem with Stevensville to be at the wire ahead of All Bets Off. The $124,744 final of the Lismore, for glamour-gal fillies may offer value in the big beaten favorite that resulted in Rusty Bliss’s $62.50 place offering—we gave you that one as our second choice to Also Encouraging, the public choice that finished fourth after a wide trip trying to get the top cost her the final quarter). Also Encouraging and It Was Fascination should create the Lismore exacta at the wire, both making amends and creating a sound exotic by beating the obvious choice of the final, Southwind Silence. In major prep mode for the million-plus bucks in the North America Cup elims (June 7) at Mohawk, glamour-boy pacers battle in three divisions of the Somebeachsomewhere Stake. Each split has a price tag of $75,000. In round one, two top division colts, Jk Endofanera and Luck Be Withyou, leave from the outside posts and take with them the majority of win bets. All things being equal in their trips, we favor “Luck,” who seems to tower over the entire field. He may also be a huge favorite, so judge your own sense of value here because he could be value if “Jk” gets more than his share of the pool. Split two could wind up the better of the trio for the bettors, as local favorite Somewhere in L A could take much more money than deserved, leaving some chunky change for others, primarily Always B Miki. He was dynamic winning in New Jersey and trainer Joe Holloway always sends his top stock out prepared to give their all. If the win money is split between “L A” and Burke’s Somestarsomewhere, “Miki” could be a strong second or third choice. The last in the triptych is an essential test for He’s Watching. He has to produce here, else he loses more than the race; he will have to begin dismounting his pre-ordained throne as the divisions’ best. Certainly a trip to the “Cup” elims would seem moot if he races anywhere near how he did in the Rooney elim. Also missing here is National Debt, who has had his own troubles with miscues in his soph debut. This looks to us like a perfect field for Jet Airway to fool the bettors and the foes. He was very good as our 21-1 choice in a Simpson split at the Meadowlands where he finished second and is improving with every contest. The price will be right. The New Jersey Sires Stakes championships for sophomores on both gaits is a feature on May 31 at the Meadowlands (see the trotting ranks at the Hambletonian Trail blog). The $100,000 affairs for colt pacers hosts a small field of five and offers a duel that may ensue through the season, with up-and-coming Doo Wop Hanover and posturing Western Vintage. The latter has been made an overwhelming favorite and that may be obvious now that He’s Watching had a less-than-brilliant debut as a sophomore. “Doo Wop” must prove, without “Vintage” making a gait mistake, that he is better going eye to eye. Either way, it is a race to watch for future performances of the other three, rather than bet against either of the top two. The fillies’ final brings up a possibility that has a few layers of support. Highland Rockstar is competitive, though not yet a winner among winners, that has had a number of excuses against the likes of this group. One huge and unfair negative that the bettors lay upon him is his driver, veteran Mike Lachance. Mike’s current win record at the Meadowlands is one for 81, so the bettors have put the classy veteran to pasture when they should be respecting his prowess based on his sterling experience, especially in high-pursed affairs. This makes for a terrific overlay in a field where no one filly has a distinct advantage, certainly not concerning a driver or breeding. It would be just like life to find Lachance in the winners’ circle with this enormously paying filly and a slew of so-called smart handicappers scratching their heads while you and I collect. The $160,000 Roll With Joe mile for FFA pacers is Sunday’s big event at Tioga. If they weren’t in the Molson Pace on Friday, chances are they are in New York for this 10-horse fiesta. Sweet Lou comes straight off of his Meadowlands jaunt last week in the Open; he has two wins in five starts this season and has only been off the board once. State-champ Heston Blue Chip is ready to challenge, himself two for five and in tune with this group that teeters on the 1:50 mile mark. With five wins in 14 starts this season, Dovuto Hanover may be potent here, certainly at a price. He had a lot of trouble at the Meadowlands, suffering major path problems, in an Open and then was battered from post 8 last week (at 55-1) against “Lou.” His pacing, however, is not a product of insipid speed; he is fast and in the right spot will fire. This could be the right spot.